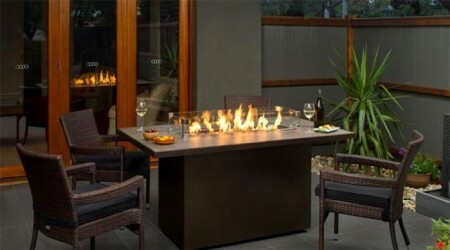 Fire Tables For Sale in Burlington, Oakville and Milton - Legends Landscape Supply Inc.
Add to the ambience of your outdoor living space with a flickering flame. That trendy new restaurant that everyone is trying to get reservations for? Your patio can put it to shame. A contemporary fire table will give your landscape the ambience that will have your friends and neighbours begging for an invitation. Our products are fueled by natural gas or propane, meaning you will not have to clean up ashes as you would with a traditional campfire. Their quick ignite switch lets you spend your time conversing rather than fumbling with firewood. You only need an “AAA” battery to create the spark on our models. Select from stainless steel or iron grey powder coated table surfaces that compliment your outdoor living space without demanding a lot of cleaning or maintenance. The strong tempered glass shield prevents little fingers, snacks, or drinks from finding their way into the fire, and preventing the flame from blowing out. Your feature is not only a focal point- it’s also functional as a dining space. You will not need a dining set in addition to your outdoor fire pit; it can act as both. Come browse the elegant and modern designs in our Burlington showroom. Our expert staff are eager to provide product recommendations based on your unique needs.